Planning Your Next Big Trip. — THINK LESS. TRAVEL MORE. THE FIRST RULE OF PLANNING? You might think that the more you plan and prepare, the better your trip will be. An adventure to a developing country can be a major investment of time and money, but to avoid undo stress, hassles and disappointment we recommend that your only plan is to stay as flexible as possible. You heard it here first: stay bendy, kids. That said, there are a few things you'll need to figure out before blast off. What's Your Trip Style & Purpose? Do You Need An Itinerary & Timeline? WHO YOU TRAVEL WITH SHOULD BE A MAJOR DECISION. Tour Group vs. Independent Travel. One of the first big decisions to make is whether to travel alone of with a group. You should consider the pros and cons of each for you, personally. If you're the type who likes to go first class, tours can actually be the most economical way to see a country because you'll get all-inclusive deals that include three restaurant meals a day, shiny accommodations and transport at a discounted rate. Such comforts these days are far more expensive when you're not booked through a tour. That said, tour groups that unload on the world's cities are treated as an entity -- a profitable mob to be fed, shown around and moved out. Talk about vagabondage. Not only is it cheaper to go indie, but you'll have the bonus of enjoying the personal side of international travel. Because that's more our bag of tricks, from this point on, this guide will focus mainly on the skills of DIY travel but that doesn't mean what we have to say doesn't apply to those who prefer a tour or two. Solo, Bestie Travel or Group Getaway. This is a tough one. You've really got to weigh the advantages and disadvantages of traveling alone, with a significant other or with friends, all of which can end of completely differently given the country, duration and the nature of the relationships. Traveling alone gives you complete freedom and independence. You never need to consider what your partner wants to see, where he wants to go, how fast he wants to travel, when he's tired, or sometimes most importantly-- what kind of money he wants to spend. You'll meet more new people because locals/travelers alike will find you more accessible and loneliness will cause you to be more open to new friends. When you're traveling with someone, it's just too easy to focus on your partner and forget about meeting the locals. You'll learn more about yourself and your destination. Without the comfortable crutch of a friend, you're more likely to know the joys of self-discovery and the pleasures found in the kindness of strangers. You'll be exploring yourself as well as a new city or country. The trip will be completely your own. Without anyone else chiming in, you'll never have to do anything that doesn't interest you during your precious time away. You'll also never have a truly spectacular moment tainted by a petty fight or disagreement with your travel partner. 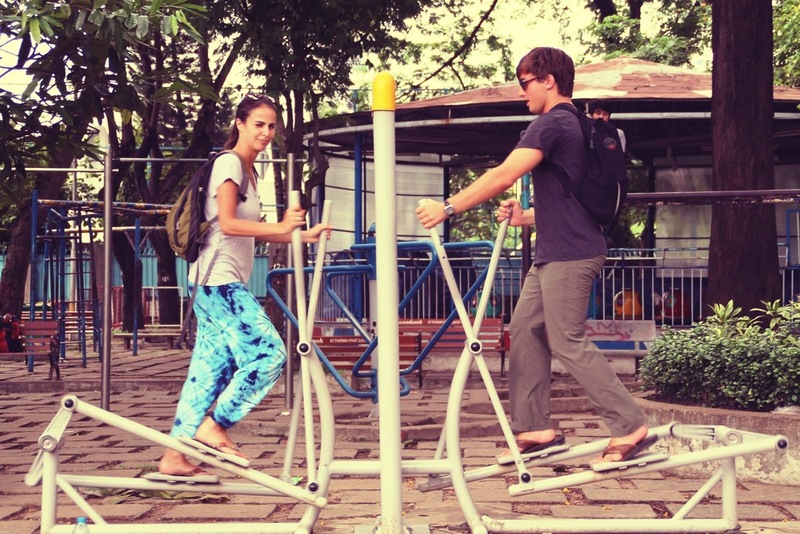 Nothing brings a couple together faster than Thai calisthenics! The downside: traveling alone can be lonely. Big cities can be cold and ugly, being sick alone is an experience you'll try to forget and if you don't branch out, meals can be served in a puddle of silence. That said, most budget destinations are full of solo travelers and there are a ton of natural meeting places, especially if you're open to staying in hostels or guest houses. In many countries travelers tend to follow the same well-worn paths, and you'll be surprised at how many times your paths will converge. It's usually cheaper, because rarely does a double room cost as much as two singles and those traveling in pairs can split the cost of taxis, maps, storage lockers, etc. You share the burden of time-consuming hassles, like standing in line for a ticket or dropping off the laundry. Travel accelerates your relationship -- for better or worse. A mutual experience is unreasonably stressful on a relationship but can be the greatest way to get to know somebody in every conceivable sense. Threesomes spell trouble. Too many minds (be that three, four or five) can spell power struggles and petty jealousies. It also makes logistics more complicated. Last minute plane tickets for 5? Or hitchhiking through Malaysia? YOu can't really expect the driver of that Mercedes to squeeze you all in to the back seat. ESTABLISH YOUR TRAVEL STYLE & PURPOSE. WE KNOW THAT "Purpose" is a loaded word. It means different things to different people, but your "purpose" is something to consider before starting out on your big adventure. Some people want to relax and rest after a stressful year. Their trip will be very different than someone whose goal is to climb the highest peaks in Asia or learn a new language. Understanding your purpose and goals can give your planning a target. The FOMO-Phobic Traveler [No Stone Unturned]. It's only natural that many travelers will want to see as much as possible in whatever time they have and plan a meticulous, rigorous schedule to do so. But in such a manner you will get unstuck as totally effective planning is never possible and certainly not when sitting at home. Have a rough idea about where you want to go, what you want to see and how much time you have. From there relax a little, taking days and circumstances (festivals, unrest, visas delays, food poisoning, bus fatigue, hearing about somewhere new, etc.) as they come - quality not quantity. That said you can still travel fast and see a lot if you want. One breed of traveller will get pretty bored sitting in the same place for days on end and want to keep moving and see more and more. Most common is to rush around sights and then all of a sudden, when finding the right place, take a good rest and enjoy what's there. The other breed of traveller you will come across - maybe you are one of them - tend to spend weeks in any sort of resort with good prices, facilities and/or a "scene". These folks are all about taking it slow, and travelers' hangouts are all over the globe. You'll know them when you see them, and you might be tempted to stay awhile. ! The main reason, and one that perhaps many of their residents might not admit to, is that traveling is hard work. No one likes sitting on buses, but that's how you get places and independent budget traveling on the whole is not about or conducive to relaxing. If you want to get the most out of your trip and make it the best value for money, to a certain extent you do have to be determined to push on. Travel as hard or fast as you like, but having an idea of your style and purpose will make it easier to get serious about your planning -- but not until you make a decision about the length of time you're able to get away. Once you figure out style & purpose plus trip length, it's time to move on to the itinerary. 1. Travel in developing countries can be very time-consuming. Oftentimes roads will be one step above primitive and bus travel is slow. Allot extra time to cover the delays you're almost certain to encounter as well as the time you'll wile away tracking down the right bus, tuk-tuk driver or ferry captain. More general info on transportation here. 2. Punctuate a long trip with rest periods. Alternate between countryside and city. There are few things more grueling than extended travel through and Third World region by local transport. We try to take one day off a week to do nothing in particular. If your trip is six weeks or longer, schedule a vacation from your vacation in the middle of it. Recharge your touristic batter by spending several days in a place where you couldn't see a museum or take a tour even if you wanted to. A stop on an island or in the mountains, on a lake or in a friendly rural town is a great way to revitalize your traveler's spirit. 3.Leave some slack in your itinerary. Everyday chores, small business matters and transportation snafus can add up to about a day a week if you let them. 4. Hit up the least culturally exotic countries or areas first. For instance, if you plan to see Japan, Hong Kong, Thailand and India, do it in that order so you'll ease into the more intense and difficult travel. If you make that trip in reverse you might be bored by the orderliness of Hong Kong and Japan after the chaos of India. 5. Think of your trip as a sampler platter. You'll never satisfy your thirst for travel with one trip. Don't try to. Enjoy what you're seeing and forget what you're missing. If you worry about things that are just out of reach, you won't appreciate what's at hand. 6. Plan for as many festivals and national holidays as you can. This takes some study, but making an effort to be in the right place at the right time is worth the trouble. Keep in mind that during holidays and festivals businesses may be closed and transportation will be crowded. 7. Don't underestimate your saturation point. Whether it's your first trip or your fiftieth, travel is intense. Assailing your senses with new sights, sounds and smells can be fantastic, but it can wear your body down. Rare is the tourist who doesn't become somewhat jaded after six or eight weeks of travel and nothing is worse than thinking, "Oh, another elephant" or "Here goes temple number 30". Be selective and save your energy for the biggies. 8. Consider your equipment & the weather. If you want to hike the Himalayas and hit up the Thai islands in one trip, do yourself a favor and try to hike first so you don't have to haul around your heavy boots and parkas on the beach. If you must, play it smart. Leave your heavy-duty gear with a friendly hostel for a few weeks until you return from your R&R in the sun and sand. It all fits, but out of 21 days, he'll spend 10 days on the road and only 3 on the beach. If his goal is to relax, this might not be what he's looking for. With this plan he'll save money by eliminating flights, relax a little more AND make sure he stays engaged by mixing up cities vs. countryside, lounging vs. hiking. Sounds like a nice little getaway, eh? Day 1: Fly to Bangkok. Arrive late at night. Take Taxi to town and stay at Shanti Guest House. Day 2: Free morning. See Grand Palace & Wat Phra Keo in the afternoon. Day 3: Get an early start. Take the water taxi along the river in Bangkok, stopping at Wat Po and Wat Arun temples. Wander and visit the markets in the afternoon. Thai dance performance at night. If you don't want to hassle with an itinerary, just pick the country you want to visit, consider the weather and then loosely plan your trip so you can respond to your mood and/or places you hear about along the way. If you've had enough of the beaches in Thailand, head for the mountains of Nepal. If you've met new BFFs in Malaysia, you can drop your original plans for Indonesia and head together for Sri Lanka. Plans are meant to be broken, and if you really want to leave things open for change be brave and buy a one way ticket -- it's easy to find a reasonable fare for your return once you have a better idea mid-journey. DETERMINING HOW LONG YOU CAN TRAVEL. There are opportunities in life when taking time off to travel is relatively easy. Longer isn't always better, but it usually is. If you have weeks & not months to travel, this shouldn't deter you. Sure, you need to plan a little more pick one or two destinations and remember a few regional flights and a little bit more money can help you see more than you'd imagine. e're putting together a whole guide on how to maximize a 10 day to 2 week trip. Coming soon! DETERMINING WHAT YOU NEED TO TRAVEL TO YOUR DESTINATION. Nothing will f*ck you up like arriving at immigration & discovering your paperwork isn't in order. Valid passports, usually with 6 months remaining validity, are required for almost every country. Make sure you're allowed to travel to your planned destination with your given passport and past travel history. For example, you can't go to Malaysia with an Israeli passport or entrance stamp. For a short trip, get your visas ahead of time. There's no point in spending a half a day chasing bureaucrats at the embassy when you can get your documents in advance. On an extended trip where your plans aren't 100% solidified, grab them as your travel. Some countries require proof of immunization against cholera, smallpox and yellow fever if you are coming from an area infected with those diseases, but more on that later. Check out our guidebook reviews here or visit our Country Guides for specific recommendations. Well, duh. Do yourself a favor and check out our whiz bang guide for working the system and getting the best deal [here].